The Kitchener Rangers announced today that defenceman Donovan Sebrango has committed to an Ontario Hockey League standard player agreement with the Club. The 16-year-old, Kingston, ON native was the 2nd round, 40th overall pick by the Rangers in the 2018 OHL Priority Selection. 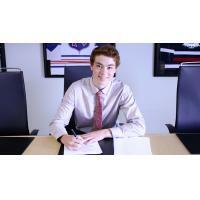 Prior to being selected by the Rangers in this year's draft, the 6'0", 168lb rearguard was a member of CIH Academy, skating in 30 regular season games registering five goals and 25 points before adding three goals and five points in six playoff games. He also played four games with the CCHL's Ottawa Jr. Senators. Donovan also participated in the Canadian Sport School Hockey League (CSSHL) Eastern Showcase, tallying two points in three games. He was a member of Team HEO at the OHL Gold Cup in May. "We are extremely excited to welcome Donovan to Kitchener," said Rangers general manager Mike McKenzie. "He has the ability to be an impact player in the OHL and we look forward to seeing him continue his development as a member of the Rangers."